Threshold Alerts allow you to monitor application health by sending a notification if the p95 response time or error rate for your app exceeds your configured threshold setting. 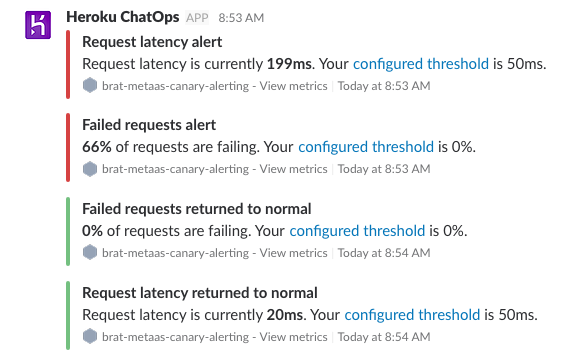 Now if you have a pipeline routed to Heroku ChatOps, you’ll also receive Threshold Alert notifications for any alerts configured for pipeline apps. Within Slack you’ll see receive a notification for the alert and when app health returns to an acceptable state. See our Dev Center documentation for more information on Threshold Alerts and ChatOps for Slack.